Two of the world’s leading scholars of the Aztec language and culture have translated Sahagún’s monumental and encyclopedic study of native life in Mexico at the time of the Spanish Conquest. This immense undertaking is the first complete translation into any language of Sahagún’s Nahuatl text, and represents one of the most distinguished contributions in the fields of anthropology, ethnography, and linguistics. Written between 1540 and 1585, the Florentine Codex (so named because the manuscript has been part of the Laurentian Library’s collections since at least 1791) is the most authoritative statement we have of the Aztecs’ lifeways and traditions—a rich and intimate yet panoramic view of a doomed people. The Florentine Codex is divided by subject area into twelve books and includes over 2,000 illustrations drawn by Nahua artists in the sixteenth century. Book Eleven is a beautifully written and careful documentation of all of the animals and plants known to the Aztecs in the sixteenth century. As the volume with the most illustrations, Earthly Things allows the reader to look at the natural world through the eyes of the Aztec. Charles E. Dibble (1909-2002) was an anthropologist, linguist, and scholar specializing in Mesoamerican cultures. He received his master’s and doctorate degrees from the Universidad Nacional Autónomo de México and taught at the University of Utah from 1939-1978, where he became a Distinguished Professor of Anthropology. Arthur J. O. Anderson (1907-1996) was an anthropologist specializing in Aztec culture and language. He received his MA from Claremont College and his PhD in anthropology from the University of Southern California. He was a curator of history and director of publications at the Museum of New Mexico in Santa Fe and taught at a number of institutions, including San Diego State University, from which he retired. 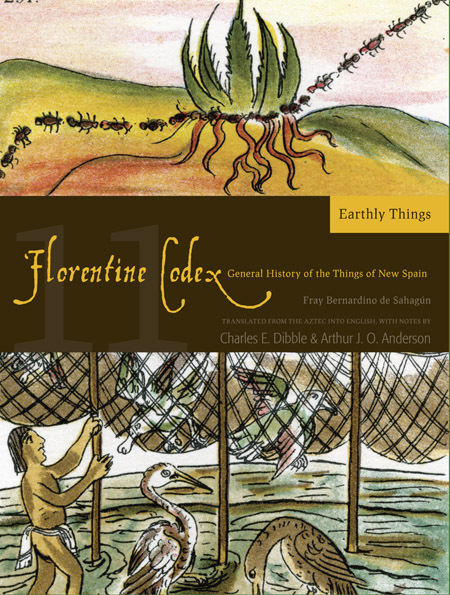 For their work on the Florentine Codex, both Dibble and Anderson received the Mexican Order of the Aztec Eagle, the highest honor of the Mexican government; from the King of Spain the received the Order of Isabella the Catholic (Orden de Isabel la Católica) and the title of Commander (Comendador).